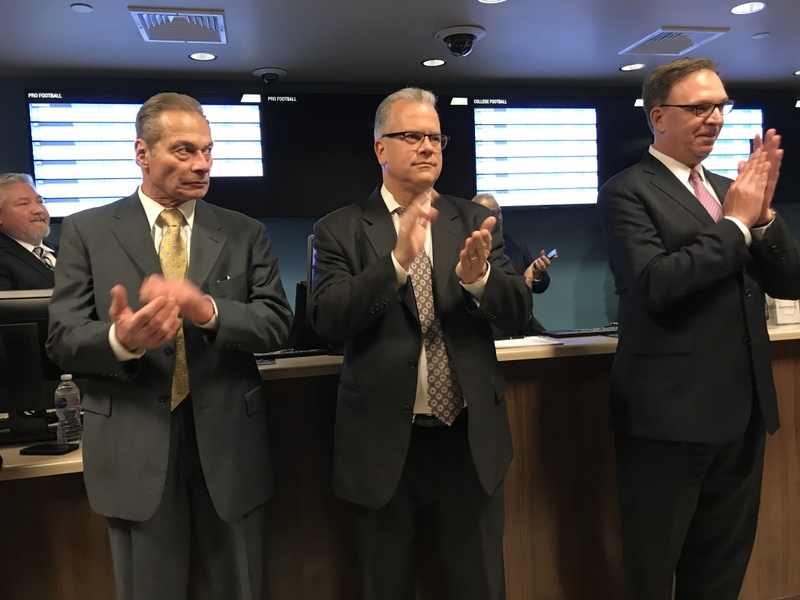 Democratic Senate President Dominick Ruggerio and Democratic House Speaker Nicholas Mattiello, placed ceremonial first bets with John Taylor, chairman of Twin River Worldwide Holdings. Photo by Tessa Roy, WPRO News. PROVIDENCE, R.I. (AP) – A bill to allow mobile wagering for sports betting in Rhode Island has passed the state Senate. Expanding sports betting is a top priority for Democratic Senate President Dominick Ruggerio. He introduced the bill to enable the creation of an app that people could use to access the sports betting offerings at Twin River Casino from anywhere in Rhode Island. Currently bets must be placed in person at the Twin River casinos in Lincoln and Tiverton. Ruggerio is seeking to address complaints of long lines at the casino and add to the state’s coffers. Rhode Island gets 51 percent of sports betting revenue.